Destination: Pluto. The New Horizons spacecraft roared off its launch pad at Cape Canaveral in Florida, USA in 2006 toward adventures in the distant Solar System. The craft is the fastest spaceships ever launched by humans, having passed the Moon only nine hours after launch, and Jupiter only a year later. After spending almost a decade crossing the Solar System, New Horizons will fly past Pluto on Tuesday. Pluto, officially a planet when New Horizons launched, has never been visited by a spacecraft or photographed up close. After Pluto, the robot spaceship will visit one or more Kuiper Belt Objects orbiting the Sun even farther out than Pluto. 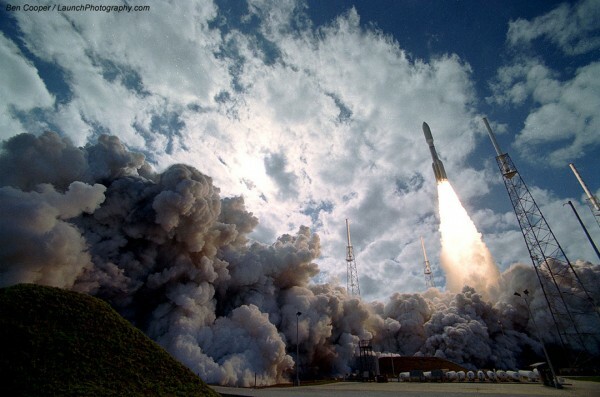 Pictured, the New Horizons craft launches into space atop a powerful Atlas V rocket.